Cost: $52,000 per mile, including total milling equipment, trucking and fuel as well as material costs. Deteriorating roads in Whitley County, Ind., were taking a toll on drivability, county budgets and road crews’ capacity to make repairs. County road officials searched for a durable and economical solution that would reduce road repair backlog and limit the need for future repairs, as well as reduce maintenance time and expense and limit traffic interruptions. County officials chose a road base reclamation program to restore Whitley’s most deteriorated roads. The reclamation process uses a road milling machine to pulverize deteriorated chip seal road surfaces. The surface material is mixed into the existing road base material with new limestone aggregate and liquid calcium chloride to stabilize and strengthen the recycled road base material. Whitley chose Great Lakes Chloride Sales, Inc. to supply a calcium chloride solution called LIQUIDOW, which is manufactured in Ludington, Mich., by Occidental Chemical Corporation (OxyChem). The road surface is milled to a depth of 5 inches. Milling is followed by the addition of 4 to 5 inches of limestone to increase road base strength. The limestone and milled road material are mixed and graded to provide a level surface and allow uniform penetration of the liquid calcium chloride. The calcium chloride application truck follows the county grader and injects half a gallon of a 38 percent concentration of the mixture per square yard of road surface. Once applied, the road is again graded and prepped to final specifications. Whitley County roads are typically graded to a 2.5 percent crown, and road crews make necessary shoulder repairs as needed to ensure proper drainage and prevent accumulation of standing water on the road surface. A steel wheel roller is used to smooth and compact the road surface before it is opened to traffic. The road is exposed to traffic until a final grading pass prepares the surface for a chip and seal treatment. The chip and seal work is completed in multiple layers. Calcium chloride attracts and retains moisture from the air, creating a solution that keeps road base material moist for an extended period of time. 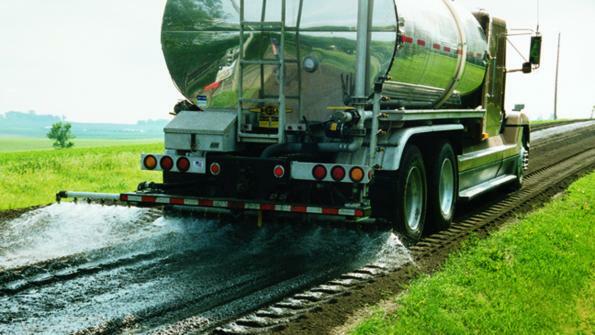 The resulting moisture cohesion binds fine and coarse gravel particles together to aid compaction and contribute strength and stability to the road base. If the finished road will remain unpaved, the cohesion created by calcium chloride also makes it an effective dust control agent, further contributing to durability. Likewise, durability is increased because calcium chloride depresses the freeze point of moisture in the road base, reducing the effect of freeze-thaw cycles and minimizing frost heaves. Michael Barton, Whitley County highway director, says, “It’s resulting in much longer-lasting roads. Rather than rebuilding a road every seven years, this process should last 10-12 years.” With this process, one can “stay ahead of new problems because the roads hold up so well,” he says.